Nestled between Brisbane and the Sunshine Coast it has two major population centres – Caboolture/Morayfield and Bribie Island – and a swathe of hinterland. First there is the margin – just 0.79%. It wouldn’t take too much to change that, a low turnout might be enough, without any change in underlying voter sentiment. And One Nation will play a part again. They held the state seat of Caboolture briefly in 1998, and according to polls are on around 14% of the vote. But Labor, in an effort to push the Greens out of the inner-city vote has not been talking to these people. Multiculturalism and identity politics aren’t things in Longman. Most people are of European extraction, and they are nationalists, not cosmopolitans. There is little enthusiasm for either Turnbull or Shorten, with the only party displaying Turnbull photos, Labor, and the only party displaying Shorten photos, the LNP. However, Liberal lieutenants, particularly neighbouring MP Peter Dutton have been tuned-in to the wave-length, talking about immigration and security issues, and Turnbull has started talking about population. Trust is also a factor. Shorten has a problem in this area, made worse by his candidate. Many electors are sceptical of her story as to how she renounced her UK citizenship. During the last week or so some “genius” in the ALP campaign decided to release the information that the LNP candidate, Trevor Ruthenberg, had claimed a military medal on his parliamentary website he wasn’t entitled to. Ruthenberg immediately admitted to the mistake, and received support from some RSL members. The Courier Mail doubled down on the story later in the week because the same medal was mentioned on his personal website. This had the effect of alerting people to Ruthenberg’s military service, a positive for him in this sort of territory, and focussed attention back on Lamb’s integrity. A readily admitted mistake on a medal seems trifling compared to a by-election, and dirty laundry, aired in the nation’s national parliament. 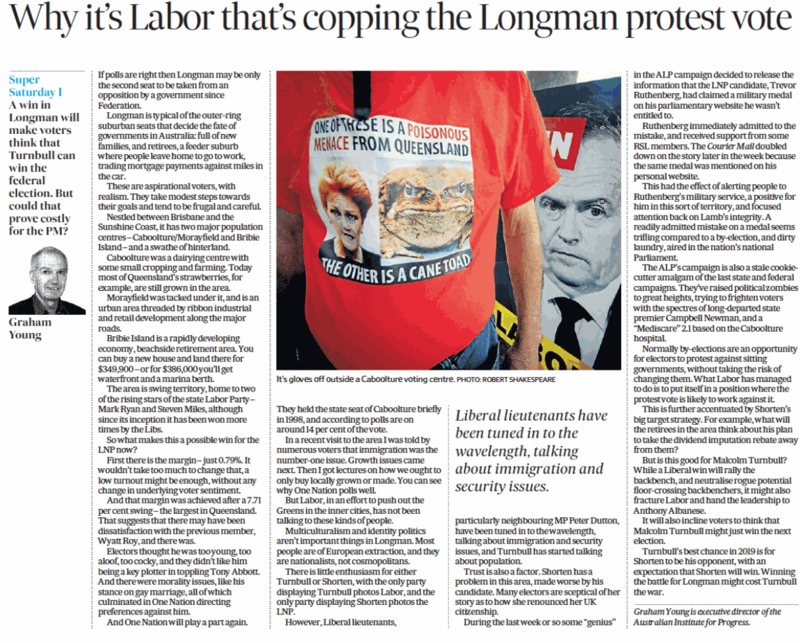 The ALP’s campaign is also a stale cookie-cutter amalgam of the last state and federal campaigns. They’ve raised political zombies to new life, trying to frighten voters with the spectres of long-departed state premier Campbell Newman, and a “Mediscare” 2.1 based on the Caboolture hospital. Normally by-elections are an opportunity for electors to protest against sitting governments, without taking the risk of changing them. What Labor has managed to do is to put itself in a position where the protest vote is likely to work against it. This is further accentuated by Shorten’s big target strategy. For example, what will the retirees in the area think about his plan to take the dividend imputation rebate away from them? But is this good for Malcolm Turnbull? While a win will rally the backbench, and neutralise rogue potential floor-crossing backbenchers, it might also fracture Labor and hand the leadership to Anthony Albanese. It will also incline voters to think that Malcolm Turnbull might just win the next election. Turnbull’s best chance in 2019 is for Shorten to be his opponent, with an expectation that Shorten will win. 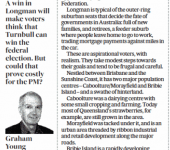 Winning the battle for Longman might cost Turnbull the war.